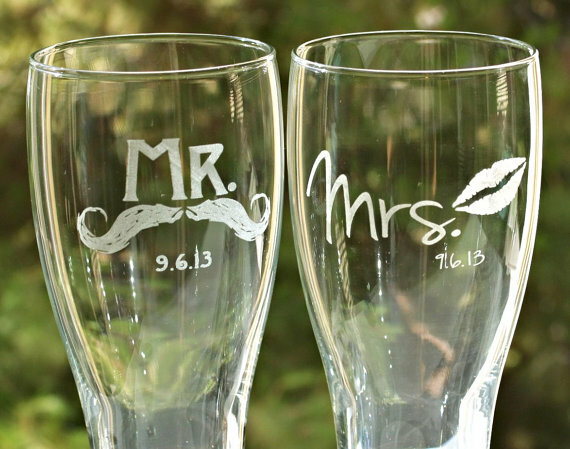 Home | Giveaway: Win a Pair of Mr and Mrs Glasses! Hello, hello! Happy Monday! Emma here. How was your holiday weekend? Ours was jam-packed with Thanksgiving fun, spending time with family, and decorating for the holidays. I did a little Black Friday shopping (hello, $9 boots and fab Etsy finds! ), but mostly kicked back at home with Andrew and our little one. Went to the park, got our tree, listened to Christmas music, and this morning I woke up to find a sneaky little Elf had hidden himself into one of the branches. Now we’re stuck with him for a month. ;) His name is Al and yes, I’m that mom who has an Elf to keep an eye on for the month of December. At least he sneaks out and goes to the North Pole for the night so I don’t have to worry about him running around the house. ;) But, I digress. P.S. I just have to ask: are you subscribed yet? It’s free and you get updates with giveaways like these to your inbox! o Prize: Mr and Mrs Glasses by Scissormill. 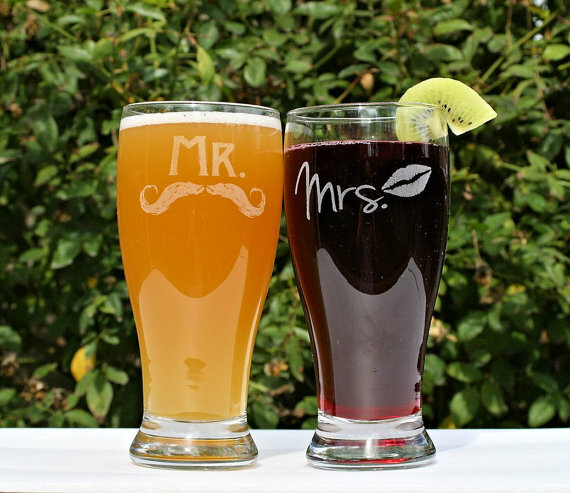 This set of Mr & Mrs pilsner glasses can be personalized with or without date. No other designs or personalization included. I absolutely adore the etched groomsmen flask! Beautifully made! I heart and favored Mr. & Mrs. glasses, but it won’t give me credit. I like the monogrammed flask. I love the personalized bridesmaid’s wine glasses! All of the groomsmen gifts from Scissormill are really unique and masculine. I’m especially a fan of the glass flask. I love the glass pitcher with the cork top! Their etched glass flasks are amazing!! I love the personalized rolling pin! LOVE the personalized wine rack with the laser etched wine glasses! I love the Mason Jar Toasting Glasses! Beer can glasses! So cute! Set of 8 Personalized Bridesmaid Gift Wine Glasses, Stemless wine glasses are super cute!! I am LOVING these super fun personalized bridesmaids flasks! So pretty but still so fun and useful!! Absolutely adore the cookie stamps!!! Need need need!!! I love the #1 dad cookie stamp! I love the personalized bridesmaid wine glasses! I absolutely love the personalozed etched mason jar mugs! This is what I want to give as favors for our wedding! I love the personalized wood wine rack. Love that it also includes etched wine glasses that go on the rack. What a great gift. I love the 48oz Glass Pitcher, it would be perfect for spring and summer. I also love that it has the personalized cap so bugs don’t get in. I love the custom beer taps! River Crossing Club Wedding: Amanda + Jared’s Beautiful Day!